We are pleased to announce the winners of our 2017 Analyst Forecast Awards. The Awards recognize the most accurate forecasters for the main macroeconomic indicators across 87 countries and 29 commodity prices in 2016. Details of the awards and the list of winners are available at: www.focus-economics.com/awards. 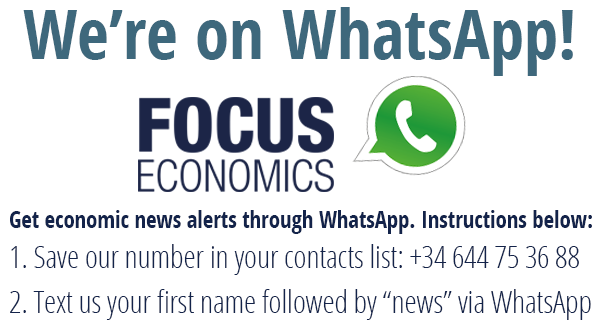 To identify the top economic forecasters, FocusEconomics assessed the accuracy of the forecasts submitted by over 350 institutions to its Consensus Forecast survey over the course of 24 months. Among the winning institutions are the world’s most renowned international banks and economic research firms such as BMI Research, Capital Economics, Citigroup Global Markets, Deutsche Bank, EIU, HSBC, JPMorgan and Oxford Economics, along with many others. The Economist Intelligence Unit and HSBC Research topped the list with 40 and 28 first place rankings, respectively, for the main indicators in various countries and commodity prices. FocusEconomics warmly congratulates the winning analysts for their high-quality research and for having provided the most accurate forecasts. “The Analyst Forecast Awards demonstrate the outstanding work of the economic analysts on our panel. We are pleased to recognize the accuracy of the forecasts and the value of economic research provided by the institutions participating in our Consensus Forecast,” says Arne Pohlman, Chief Economist at FocusEconomics. FocusEconomics surveys over 900 economic experts from national and international banks, top financial institutions and economic research companies every month to obtain their projections for the main macroeconomic indicators and commodity prices and elaborate the Consensus Forecast, which is the lynchpin of the company’s monthly FocusEconomics Consensus Forecast reports. The FocusEconomics Analyst Forecast Awards are yearly awards that recognize the analysts whose forecasts for the period are the most accurate. We assess the accuracy of the forecasts submitted to our Consensus Forecast survey by ranking forecasters according to the average of their discounted forecast errors. Errors are defined as the absolute difference between an individual forecast and the actual result of the macroeconomic indicator/price of the commodity. To identify the best forecasters, we use forecasts submitted to our monthly survey over the course of 24 months*. For example, in assessing the forecast accuracy for 2016 GDP, we take into consideration forecasts collected in the January 2015–December 2016 period. The result we use corresponds to the first official estimate, the release of which varies according to the frequency of the indicator. The absolute error (absolute difference between the individual forecast and the outturn of the indicator) is then discounted so that an error at the beginning of our forecasting cycle (January 2015) has less weight than an error at the end of the cycle (December 2016). This ensures that the forecasters are rewarded for having smaller errors at the beginning of the period when less information is available and hence forecasting is more difficult. Finally, panelists are ranked according to the average of the discounted absolute errors over the last 24 months. The highest ranked analyst is the one with the lowest average discounted error. To be considered for the award, the panelist must have submitted a minimum number of forecasts over the course of the period. We calculate forecast accuracy rankings for six main macroeconomic indicators (GDP, Fiscal Balance, Inflation, Interest Rate, Exchange Rate and Current Account) in 87 countries. In addition to giving awards for each specific macroeconomic indicator mentioned above, we also provide a general ranking of the forecasts for the country, which is estimated by calculating weighted average ranking across all the indicators with GDP and inflation having slightly greater weight than the remaining indicators. *For Sub-Saharan Africa the forecasting cycle is 20 months. To identify the best forecasters of commodity prices, we use forecasts submitted to our monthly survey over the course of 12 months. For example, in assessing the forecast accuracy for the 2016 year-end price of copper we take into consideration forecasts collected in the January 2016–December 2016 period. The outturn we use corresponds to the price at the end of 2016. The absolute error (absolute difference between the individual forecast and the outturn of the price) is then discounted so that an error at the beginning of our forecasting cycle (January 2016) has less weight than an error at the end of the cycle (December 2016). This ensures that the forecasters are rewarded for having smaller errors at the beginning of the period when less information is available and hence forecasting is more difficult. Finally, panelists are ranked according to the average of the discounted absolute errors over the last 12 months. The highest ranked analyst is the one with the lowest average discounted error. Further information is available at www.focus-economics.com.